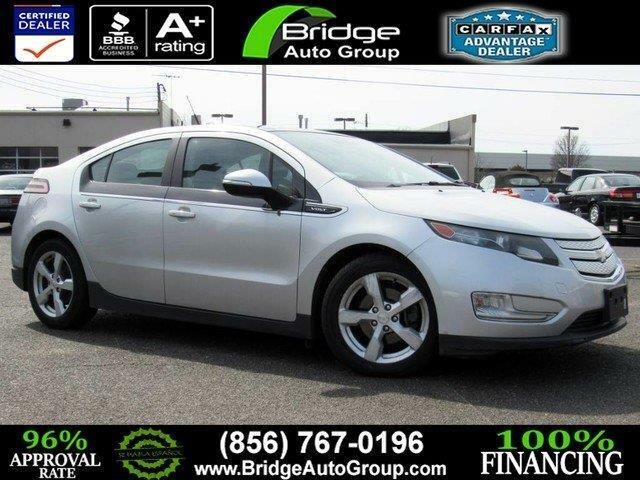 You can find this 2012 Chevrolet Volt and many others like it at Bridge Auto Group. This Chevrolet includes: HARD DRIVE, 30 GB OF AUDIO DATA STORAGE Hard Disk Drive Media Storage MP3 Player SEATS, FRONT BUCKET WITH RECLINING SEATBACKS AND ADJUSTABLE HEAD RESTRAINTS (STD) Bucket Seats ELECTRIC DRIVE, VOLTEC 1-Speed A/T A/T SILVER ICE METALLIC JET BLACK SEATS/CERAMIC WHITE ACCENTS, PREMIUM CLOTH SEAT TRIM Cloth Seats ENGINE, RANGE EXTENDER, 1.4L INTERNAL COMBUSTION ENGINE 4 Cylinder Engine Plug-In Electric/Gas LOW EMISSIONS PACKAGE (ENHANCED AT-PZEV EMISSIONS) AUDIO SYSTEM, COLOR TOUCH AM/FM STEREO WITH CD PLAYER AND MP3 PLAYBACK (STD) CD Player AM/FM Stereo MP3 Player *Note - For third party subscriptions or services, please contact the dealer for more information. * This vehicle is loaded with great features, plus it comes with the CARFAX BuyBack Guarantee. This 2012 Chevrolet Volt has great acceleration and wonderful styling without sacrificing exceptional fuel economy. In addition to being well-cared for, this Chevrolet Volt has very low mileage making it a rare find. This wonderfully maintained Chevrolet Volt is in the top 10% of its class when it comes to cleanliness and condition. This hard-to-find gem is an exquisite example of meticulous attention to detail and rich refinements. More information about the 2012 Chevrolet Volt: The Chevy Volt is unique in that is the first electric vehicle that successfully marries an electric motor and battery with a conventional engine that keep the vehicle powered up over longer trips. In doing so, GM has created an ultra-efficient vehicle that for many commuters, may require no gasoline at all. The Volt was intended to be a super-efficient car that also includes all the modern safety and convenience features expected from a modern 4-seater, and as a result, the MSRP of the Volt might initially seem a bit high at just over $39,000. But this price buys impressive technology that is the first of its kind in the US, and running costs that some have estimated as low as 5.7-cents/mile. Volt buyers may be able to take advantage of federal and state tax credits as well, making this revolutionary car more affordable than its base price suggests. Interesting features of this model are The latest in high-efficiency technology provides extreme fuel economy with few compromises in performance or features.